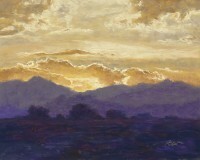 Grace was introduced to pastels at an early age by her parents, who were professional artists, and has studied and worked in the medium throughout her life. She paints a variety of subjects in an impressionistic style, with an emphasis on the effect of light and color. She is a Signature Member of the Pastel Society of Colorado, a former long-term member of the Artists Association Northern Colorado (AANC), a member of the Plein Air Artists of Colorado (PAAC), and a juried member of Trimble Court Artisans. 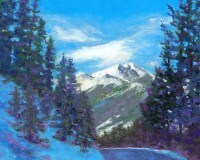 Grace's work is exhibited in Trimble Court's gallery in Ft. Collins, Colorado. Her work has been juried into regional, national and international exhibitions including the Richard Schmid Fine Art Auction, Mile High National Exhibition (Pastel Society of Colorado), and National Greeley Art Exhibition & Sale, The National Juried Competition/Exhibition of the Texas Pastel Society, Lines into Shapes Exhibition, AANC National Art Exhibition & Sale, and the Englewood Arts National Juried Art Show. Her pastels and commissions are in private and corporate collections across the United States. Pastel is my medium of choice because of its intoxicating colors. I love working with pastels...applying pigment directly to paper or other surface fits well with the way I see things and my desire to capture and interpret color and light. Both are essential for conveying a mood, and my artwork is just that...an attempt to convey and share my emotional response to the subject at hand. I have always found artistic and spiritual inspiration in the extraordinary ordinary moments in nature and everyday life. My hope that others also begin to see ordinary subjects as much, much more through my artwork...and that it enhances their own sense of appreciation for the beauty that surrounds us.